Site review: BookRabbit – Last.fm for readers? 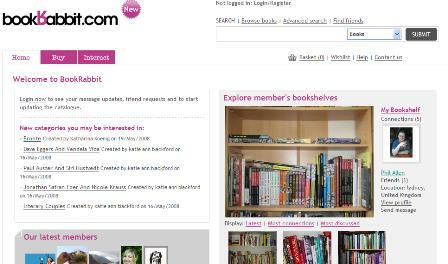 BookRabbit, launched last week, is a new website which aims to do for books what Last.fm has done for music on the web. Aimed at keen readers, BookRabbit combines the recommendation features of Last.fm with a social network, while users can also buy books from the site. First, users need to set up their profile pages by uploading pictures of their bookshelves. Eventually, BookRabbit plans to introduce ‘Automatic Bookcase’ technology. As Last.fm’s Audio Scrobbler technology automatically populates your profile with the music you listen to via Last.fm and iTunes, this will scan books on your shelves from uploaded photos and populate your profile with these titles. This is fairly time consuming, and anyone with hundreds of books to display on the site will perhaps want to wait for the automatic software, but it is an easy enough process. Once you have uploaded a few books, BookRabbit will use these to find matches with other users to help you find likeminded readers, and follow their recommendations. As with most social networks, you can connect with and add friends from the site, discuss books, share reviews and wishlists, all of which can be very useful when you are looking for the next book to read. You can also just browse through books by category on the site, and buy direct from BookRabbit. The site claims to check its prices against Amazon, offering the top 100,000 titles at lower prices than the online retail giant. Payment options include PayPal, which is useful for people who either have no credit cards, or prefer the relative security of shopping via this method. Having played around on the site for a few hours, it’s difficult to find too many faults with it. The website is very easy to use and understand, with good, simple navigation and clean presentation of content. Browsing for books on this site is pretty easy, and helped by the ability to get recommendations from other users. The only slight drawback for me is that, until it can automatically read my bookshelf, the process of adding your book collection to the site is slow, and nowhere near as easy as Last.fm is for music. In addition, it would be a good idea for the site to provide recommendations directly to me, based on the contents of my bookshelves. Is Kindle Fever pulp fiction? I’ve been talking to clients a lot recently about the problem of heavy mice on websites, i.e., the lack of incentives – or cheese trails if you’ll let me extend the metaphor – to motivate customers to click through to the next page and the next page after that. Something as simple as telling them what they might find on the next page will help click-through tremendously and we all know that increased click-through ultimately means higher conversion and revenue. Selling on the web is quickly becoming lessabout marketers’ supply meeting up with customers’ demand, and more about customers themselves actively bringing their demand toward supply. In fact, they’re creating supply in many cases. And successful marketers are creating experiences for customers — not merely selling to them. The new revamped and rebranded Mail Online website came out of beta this week, with a number of improvements to the previous version. There is one major problem though; browsing through the site and loading pages can be a painfully slow process.